Do you ever have those recipes where are you just positively, absolutely certain that they will be terrible and that you shouldn’t make them… and yet, you are inexplicably drawn to them and know they’re not going to stop nudging you until you cave? Right, so this was one of those. You see, several years ago, I was watching some undoubtedly average “healthy cooking” show where the chef suggested that one take half the pasta they wish to eat, replace it with chunks of cauliflower, boil them together and then cover it with marinara sauce. Even though I never made it or even considered making it, it turned my stomach so much that to this day, I can’t seem to forget it. Yes, let’s cook cauliflower in the least appetizing way possible because it is “health food.” Right. Where do I sign up?! I was also concerned about the whole wheat pasta, which I just don’t care for. As you can probably tell from my sniping at the “healthy cooking” show, I refuse to eat something that doesn’t sound good, great even, just because it is good for me and whole wheat pasta has also always been one of these things. Seeing as it has no fewer calories than the white-flour stuff and only a smidgen more nutrients, nobody could sell me on it, no siree. But here was whole wheat pasta as it should be, in a dish where the white flour stuff would be too supple or even boring as texture reigns supreme. The cauliflower played off the walnuts, the whole wheat pasta absolutely worked, the lemon juice and vinegar brightened the whole thing up and the ricotta salata (well, we used feta, actually) made it soar. I can’t tell you how much we liked this, no wait, I can: I brought the leftovers to work the next day and had the best lunch I’d had in months, and I am making it again tomorrow night. This never happens. Since we’re talking about cauliflower today, here’s a little cauliflower-chopping tutorial that you probably don’t need, but I sure did a couple years ago when every time I cut one up I’d end up with breadcrumb-sized cauliflower bits everywhere, not to mention really muddying up a dish like this. One day I saw Bobby Flay cut one up on one of his shows (thankfully, not the one I mentioned above) and light bulbs went off all over the place: work with the cauliflower’s natural shape and it will work with you. He removes the core in one large piece, let the freed flowerets fall to the counter and cut only where there is a nautural break or bound stem and there is tremendously less mess and waste. How about that? Oh, you’ve been doing it this way the whole time? Well fine then. Show off then, why don’t you? I suggest you start with this. One of the loveliest things about this recipe–and there are many, in my mind–is the way the recipe is laid out. It is as if Alice Waters in the kitchen with you, telling you that you can just chop all that while the water boils and really explaining the central tenet of this recipe: cauliflower that is cooked to a crunch, not steamed and for heaven’s sake, not boiled. She also thinks you should have this with a crisp white wine–for real! Put a large pot of water on to boil. Cut the cauliflower into small flowerets. Peel the onion and slice it very thin. Peel and finely chop the garlic. Put the pasta on to cook. Saute the cauliflower in olive oil in a large saute pan. When the cauliflower begins to soften, season with salt and pepper and add the sliced onion and red pepper flakes. Saute over medium to high heat until the vegetables are brown and tender. 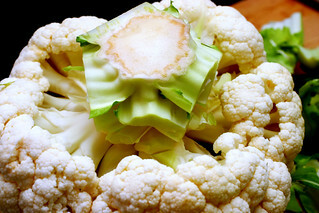 The cauliflower should still be slightly crunchy and should not taste steamed. Add the garlic and remove from the heat, tossing and stirring so the garlic doesn’t burn; if it starts to brown, add a splash of water. Add a few drops each of vinegar and lemon juice and the toasted walnuts. Taste and correct the seasoning. When the pasta is done, drain and add to the cauliflower, adding enough extra-virgin olive oil to coat the pasta thoroughly, toss together and serve, with the cheese crumbled over the dish. Wow I have to admit that my stomach did a flip at first glance but your description has sold me over. Especially on the best leftover lunch in a long time – now that’s a convincing pasta. Hurray for being courageous! That sounds very intriguing! And it’s so simple. Bookmarking this, thanks! I would have been very dubious of this recipe, too. Cauliflower has not been high on my preferred list (hate it raw). Though recently I got turned on (I mean really turned on) by a cream of cauliflower and Stilton soup (photos here), so I suspect I might enjoy this pasta dish, too. Thanks for being adventurous enough to test-drive it for us! Here’s another interesting pasta-cauliflower scenario. I love Sally Schneider’s cookbooks, and in her latest book, The Improvisational Cook, she has a recipe for a cauliflower puree that calls for adding a small amount of dried pasta to the pot of boiling milk and cauliflower. The pasta, I guess, just helps thicken it up. you can’t even taste it. it’s delicious! Amazing! 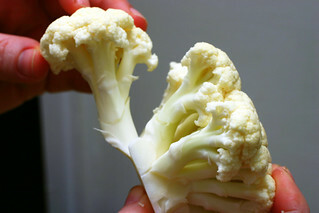 Caulifower is just one of those veg that you know you should be eating more of, but can somehow never find a way to cook it that is both good looking and tasting. I may just have to give this a try! Merci. This may be the first time in my life that I’ve actually found a recipe for cauliflower that I would eat with hopes of enjoying. I am only mildly distracted by the fabulously goregeous picture of butterscotch ice cream below it….no fair, I’m either going to make this ice cream or be forced into a Haagen Daz run…. ….so much for the poor cauliflower, I’m afraid it now pales in comparison to its richer, creamier neighbor. Suzanne has a point there :) Cauliflower or butter scotch ice cream? Almost a non contest. The pasta dish does sound like something to try, though. With a crisp white, I think it’ll be a winner! I love cauliflower, but I could not even prepare this if my boyfriend was in the house. I do think my girlfriends could appreciate it though, so I’m adding it to my girlie nite menu list. Thanks for reminding me about this dish. Cauliflower and pasta was a staple for my southern Italian grandmothers and I think I need to make some of this soon. Now, if you really want to love cauliflower here’s what you do. First, steam or boil the cauliflower until just tender, or crunchier if you prefer. Drain and let it cool to room temp. Then, make up a breading of dried breadcrumbs, lots of parsley, grated Romano cheese (Parmagiano just doesn’t have enough of a punch) and salt and pepper. Dip the cauliflower florets in beaten egg then the breadcrumbs and fry until golden brown. For the complete southern Italian peasant food experience, do not throw away the oil and bits in the pan. (If you wish, add more dried breadcrumbs and brown them in the oil.) Then add some hot pasta and toss with more Romano cheese. Nothing is thrown away. That was also done after frying up a batch of veal or chicken cutlets too. I actually like cauliflower, though somehow avoid making it. Should have known Alice would come up with a way to make an over the top dish. Your pictures are great once again. I am going to make this for my healthy non-meat eater daughter. You should be the new spokesperson for the Cauliflower industry. I bet they experience a sales increase after this post. Mmm . . . after my trip to Chez Panisse, anything Alice Waters tells me to do or try, I’ll try! Can you imagine actually having Alice Waters in the kitchen with you? I’d forget how to cook, talk, act. I love this cookbook and this recipe. Glad you tried it. I think sometimes cauliflower is a hard sell. But this looks divine as usual. I feel exactly the same way about whole wheat pasta, but I also make exceptions for dishes with cauliflower! I make a very good macaroni and cheese with half whole wheat penne and half lightly steamed cauliflower. Make the cheese sauce as usual and finish in the oven. It has the benefit of not only being a little healthier than regular mac and cheese but also flat out DELICIOUS. Yes, yes, yes! Cauliflower must be sauteed on high heat. I just discovered this recently after years of steaming. It caramelizes beautifully, keeps its crunch and pairs well with so many things. My mind is open – I’m trying it with pasta! Thanks, Deb. Mmmm. I was at Lupa once and had a pasta dish with cauliflower that had been sauteed with rosemary and red pepper flakes and it was stunning. Ever since then, cauliflower and pasta has been a favorite combination in our apartment. This looks stunning as well… thanks for reminding me of my love of this combination. I’m a poor college student that doesn’t like cauliflower. But this description has made me want to drag out those pans that were bought for me freshman year and make a trip to the store… I think it was when you said you were going to make it again. We all know that doesn’t happen very often! Ah, I think I will make this tonight, finding myself in possession of all of the requisite ingredients. Thanks. Also, while plenty of whole wheat pasta tastes like a mouthful of wet sticks, Barilla’s Healthy Harvest pasta is fairly painless as far as that goes. Now if you have any ideas for making brown rice not only edible but delicious, please pass them along. This whole-grain diabetic thing is putting me off food entirely. Okay, I’m definitely making this tonight. Can’t face leftover corned beef & cabbage. But JANET!!! Your description of the breaded and fried cauliflower sounds so delicious! No garlic? I especially love the “peasant” note about the leftover oil with the breadcrumbs. When you think about it, of course they wouldn’t waste all that good oil! It makes perfect sense and it’s already flavored! I’m already kicking myself over all those times I’ve gotten rid of perfectly good sauteeing olive oil when I could have made that wonderful sounding pasta. I’ll be doing that next time I make cutlets or whatever. Thanks to both of you! It looks delicious, but I just can’t get past the farty smell of cauliflower. I think it might be my least favorite vegetable out there. Ooooh love the cauliflower. I make the world’s easiest soup from it, and love it roasted or sliced thin and roasted in lemon-butter-mustard sauce. It’s so great in pasta, too. I’ve been craving something very similar to this on the brain for a while, and I think tonight’s the night to follow through! The walnuts are a great suggestion and I have a big bag of lovely ones my mom brought from Oregon and put in my freezer. I’ll report in on my version on the Flickr, etc. can’t go wrong with alice waters, ever. 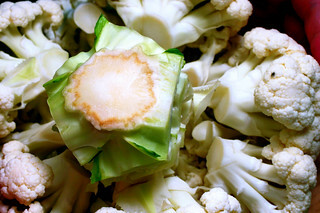 i actually really like cauliflower, your coring method will definitely help me out! whole wheat pasta doesn’t interest me much, but maybe it’s worth another try in the right dish! There is something particularly appealing about this, although it definitely sounds a little dry at first. I’m not a fan of steamed cauliflower so this may be up my alley. I think red wine and ricotta cheese would be my only changes. You think that’s weird? I cook a cauliflower pasta which, in addition to the cauliflower, has raisins, anchovies, pine nuts and saffron… It’s actually an ancient Italian dish, and it really works… Since introducing it to my household about a year ago, it’s become such a firm favourite that we have it about once a week now. Still, you can never have too many cauliflower and pasta dishes, can you? On the strength of your enthusiasm here, I’ll have to give this one a whirl… Looks fab! Oh, gorgeous. I do love cauliflower a great deal. Thanks for posting this lovely recipe which is actually doable (!!!) on a student budget, thank heavens! This sounds like my kind of recipe. Healthy, simple, fast with a gourmet flair. I’m changing my menu and making it tonight for my Tuesday Pasta night! Can’t wait. yum! Sounds delicious. A good whole wheat pasta line to try is Bionaturae, an organic line imported from Italy, and pretty easily found in supermarkets. I much prefer it to Barilla Plus. It also comes in a wider variety of shapes. It isn’t the cauliflower in this dish that would give me pause, it’s the walnuts. I’m generally a little wary of savory dishes with nuts in them (peanut sauce = yuck! ), but this receipe looks amazing! Congrats on the Real Simple shout-out, btw. I got all dorky-excited when I saw it! WOW! I just got some cauliflower in with my shipment of produce. I have no idea how to cook it so this is exactly what I was hoping for. I also have feta and pasta and walnuts…… too weird. This looks great- and I apparently now have to thank my mom – I had no idea cauliflower was boiled or steamed as we always ate it sauteed or baked in something yummy. My 4 year old loves it and clamors for it ( helped by the fact that occasionally we find orange or purple varieties at the market) This recipe will have to be a mommy-daughter kitchen project! I love cauliflower (yes, even boiled… – I can hear you gasping!) but I’ve never considered pasta and cauliflower – I am definitely going to try this! You are my cauliflower hero – Thank you, thank you, thank you – Finally, I will get my $$$ worth when cutting the stuff up! The idea of sneaking things in as though they don’t belong and then trying to casually look the other way by smothering something in marinara is awful. To me, it is like the advice to substitute diet cola for sweetener in some recipe. yuck! But I have been madly in love with cauliflower lately, and somehow we have amazingly delicious cauliflower here in Ghana. One night my husband and I did the cauliflower slightly caramelized with his classic ali oli (garlic and red pepper) and I was in love with that. I can only imagine the feta and walnuts and other touches in this one make it fabulous! I am loving cauliflower and whole wheat pasta lately, too – that whole nutty/sweet/nutty thing, I guess. I like the cauliflower cooked till it’s a little softer, and then roughly smashed with a ladleful of pasta cooking water to make a rustic, chunky/creamy sauce – with garlic and crushed red pepper, and maybe a topping of oiled and toasted breadcrumbs, it’s killer. You know, in Italian cooking, cauliflower is used a lot with pasta. Sometimes I think it is an overlooked vegetable but it is really delicious when prepared correctly. Alice Waters, of course, does it beautifully. Great dish. I’m such a remedial “chef”! Can I tell you I have never bought an actual full head of cauliflower? I mean, I’ve eaten it on veggie trays and what not, but NEVER bought it. Tonight was the night. This recipe looked easy enough. I bought all the supplies and successfully made my first dish ever with cauliflower- wow! I was a skeptic until the end, it looks a little “beige” at first, but mmmm, the walnuts, the cheese. Heaven! Thank you so much for expanding my vegitable horizons! THIS is fabulous!!!!!! Who knew cauliflower is actually worth buying?! Can’t get over it.. made this tonight as a side dish and nixed the pasta, subbed in goat cheese.. absolutely fantastic! Will be making this again soon. Hmmm … this looks great. Any suggestions for a substitute for walnuts? I’m allergic, sadly. Other nuts are OK, though. Cauliflower and penne are a classic Italian combination. There’s a fabulous version in Batali’s Babbo Cookbook, an excellent cookbook to own, as you can make the restaurant’s dishes just as well (and cheaper) at home. OK, not to be totally short bus on you, but the tutorial was muy helpful. Thanks! I love cauliflower. I never thought to add it to pasta. I think adding feta cheese makes everything all right! Just wondering what green sprinkle is on top. AJ: maybe try some roasted pine nuts-I bet those would taste great. Or pecans. That’s parsley. I’m not big on garnish but this just ached for a splash of any color. Caulifower, feta, and walnuts. Some of my most favorite things. I think my boyfriend and I are going get hooked on this one. During my culinary school days, I did my internship at Chez Panisse, so I love making their recipes and remembering the sites and smells of the kitchen! Thanks for another great post! What kind of whole wheat pasta do you use? I’ve tried a few brands and none really thrill me but I hear all the rumors that there are a few worth sticking with. 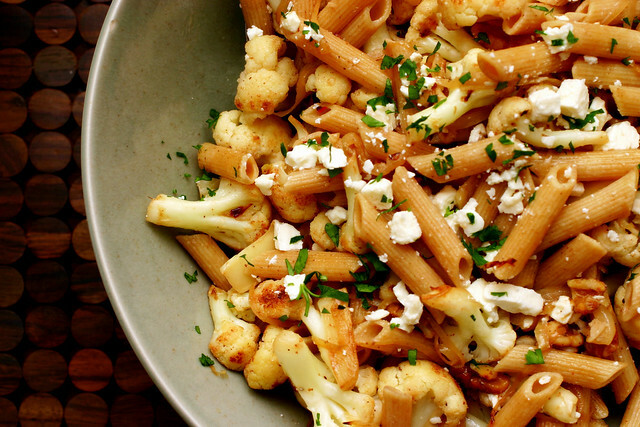 I love cauliflower with pasta–especially whole wheat. Besides delicious, what could be healthier. From the picture, it looks like there is something tomato-based in the recipe. Was an ingredient left out? Yum this looks delicious. By the way, I also made your Indian Spiced Vegetables and they’re divine. Thanks for good recipes time and time again! Have you seen the cauliflower/broccoli pasta recipe in the Zuni Cafe cookbook? It’s not dissimilar, but uses those breadcrumb pieces of cauliflower to great effect! Wow, I ‘ll have to give this a try. Thanks again for an interesting recipe. Pine nuts — of course! Thanks, Lyra. There’s no tomatoes in it–the top picture just came out really dim. I used Bionature. I remember thinking back in the day (the last time I tried to convince myself that whole wheat pasta tasted exactly the same as what I was used to) that DeBoles wasn’t bad either. “I refuse to eat something that doesnâ€™t sound good, great even, just because it is good for me and whole wheat pasta has also always been one of these things.” Amen! I’m trying to eat vegetarian more often and have had some lousy experiences with recipes with little merit other than they’re *Good For You*. Thanks for a peek into a better world! I’ve been doing something strikingly similar to this with broccoli for years, but it never dawned on me to try cauliflower. I think I’m going to have to now! I love cauliflower with pasta and this recipe looks delicious! Going to have to give it a try! Not a big fan of cauliflower, but I’m always looking for a new way to make it tasty since we have it growing the the garden. I will try your dish soon. Your blog is always so yummy looking! I made this for dinner tonight. Delicious!! I did use the ricotta salata – yum. Great recipe idea. I’m hoping for a sweet recipe coming! This sounds delicious. There is also a light and tasty recipe in this month’s Food & Wine magazine for pasta (I used whole wheat) with cauliflower and leeks. Thanks Deb – I would never have tried this if it weren’t for you. Excellent recipe. Made it last night and we enjoyed it alot, though getting enough lemon and vinegar is important. Next time, I would add more of those two ingredients. The best part was the toasted walnuts and I’m not normally a walnut fan. Out of curiousty, what type of feta do you recommend and like best? (Cow, goat or sheep feta?) I know that some are much better than others. Thanks. We really like both Bulgarian and French feta, but this was (I think) Greek feta that Alex’s mother had picked up for us at the… Russian store. (How’s that for a world tour?) It was much more firm and salty than the Bulgarian/French stuff. I wouldn’t have liked it in a Greek salad but it worked well here. I’ve beat you to many of your recipes but by God, I’d never made this dish. Delicious. I’ve forwarded it to nearly everybody I know. I got, “Okay, if you say it’s good, I’ll try it but I hate cauliflower.” Argh! Tried the recipe twice so far. Once as prescribed, and a second time with four times as much garlic and a little chardonnay instead of lemon juice. I like it both ways, but the extra garlic was necessary. Try a similar cauliflower dish in a red sauce w/ basil and bay over angel hair. Speaking of whole wheat pasta, I find a lot of it gritty and just plain gross. BUT the Whole Foods brand is delicious. And cheap. I won’t eat any other kind, and I prefer it to white pasta now. Try it. I made this tonight (with ricotta salata and pine nuts) and it IS strangely addictive! I don’t think I got quite the right crunch out of my cauliflower (two heads — could that be right? I used one and could feed an army) but still it all came together nicely. AND, three children in my house ate it after approaching the table with fear and trepidation. That makes it a winner in my book. Looking forward to The. Best. Ever. leftovers tomorrow! I have jury duty and am planning to take this with me rather than forage in the mean streets of Trenton NJ for some form of lunch. And if the jury room smells of cauliflower, oh well. Everyone can clear a space around me. I made it last night. So yummy – and you are right… it’s all things I wouldn’t necessarily like, but somehow when they all get mixed together at the end. Can’t wait to eat it for lunch! Sounds wonderful and I’m going to try it. Another good way to cook cauliflower is to roast it – just toss with olive olive and scatter it on a foil-covered pan and roast at 400 until it’s browned and as tender as you want. If you want to gild the lily, then cover it with parmesan and run it under the broiler. PS Same method works like a charm with broccoli or quartered brussels sprouts or chunks of green cabbage. One of those awesome meals where I know I didn’t overeat, yet 3 hours later, I’m still completely satiated and not snacky. I used ricotta salata, which I’ve never tried before, and… honestly I think I prefer feta. At least now I know! As for the pasta – I kind of hate whole wheat pasta. The taste is great, but that sort of grainy aftertaste (aftertexture?) ruins it for me. A few days ago, I picked up a bag of farro penne pasta by La Terra E Il Cielo to experiment with, and this seemed like the perfect recipe. As it turns out, I love farro pasta! The taste is hearty and nutty, like whole wheat, but with a much more pleasant texture. I’d highly recommend it. Made this last night and it was a big hit! We halved the recipe for only 2 people and it made plenty. I went heavy on the walnuts and ricotta though, since I think those additions really made the dish something special. An all-cauli version of the Judy Rodgers’ pasta, mentioned by Ben above, is a favorite in our house. We love it for the cauliflower and w.w. pasta, but also for the red pepper flakes, nicoise olives, parsley, and toasted fresh breadcrumbs. I’ve owned the Chez Panisse Vegetables cookbook for years and have yet to cook from it. For shame, I know. I’m looking forward to making Alice Waters’ rendition soon. Like Joanna, I made this recipe today with farro (spelt) pasta and it was AMAZING. Oh, and I used pine nuts instead of walnuts, and it was AWSOME. yeah, both amazing and awsome. Even the Husband ate it and that says it all. Thanks girl. 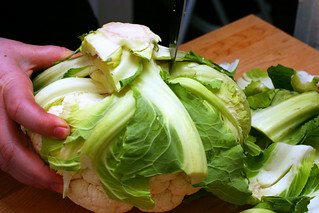 Great tip about cutting up cauliflower florets! I was searching for Sicilian recipes last week and came across references to the dish you saw on TV. Guess what’s on the menu tonight? I LOVE this dish! I used feta cheese and it was just perfect. I’ve been lurking on your blog for months, but never commented until today. I made this salad for a bridal brunch that I hosted. I added extra walnuts and several cups of lightly steamed asparagus. The asparagus was a great addition because it added some beautiful color but didn’t overpower the other flavors. It was the perfect recipe! Hearty but not heavy, plenty to go around, healthy and unique! Everyone loved it. Thanks, Deb. I am enjoying this AS WE SPEAK and it is delicious! Don’t let the cauliflower deter you from making this yummy dish! Thanks for the stellar recipe! I tend to doubt my instincts, and look for very precise recipes. However this week cauliflower is really cheap, and I love ricotta salata, so I tried it. It worked perfectly, or in any case I like the results. I made this with everything except the pasta..I just wanted a veggie side dish and it worked great. Thanks! Even more delicious with calabrese or tenderstem broccoli! I also used buckwheat pasta rather than wholemeal. thanks. I’ll add one more word of praise. I made this tonight with feta, and halved the cauliflower and pasta but kept larger amounts of the nuts and cheese. I’ll probably make it again this week, we loved it so much. Thanks! … and thanks to someone else utilizing the BS, I saw this recipe, which I made using frozen BS (cut in half). No, I did NOT thaw them, just tossed them into hot olive oil, and proceeded from there. FANTASTIC. So great, in fact, that I’ve just ordered the Chez Panisse Veg. cookbook, so thanks twice! Oh my…for those of you who think you hate cauliflower…have I got the recipe for you. And it’s sooo easy. Turn your oven on to 400. Seperate your cauliflower into bite size pieces. Toss with just enough olive oil to moisten, a few cloves of minced garlic and salt and pepper. Roast it in a shallow, rimmed pan till it gets all browned and crispy..about 20 minutes. It gets sweet, salty, heavenly! That was a great tip for chopping cauliflower! I always ended up with a lot of annoying crumbs but not this time. This recipe looks really interesting, quick & easy. I’m planning to try it on a day when I’m pressed for time. Just made this. Am eating it right now, in fact. I love it. Yum! This was wonderful! We used roasted garlic and goat cheese crumbles. We also added about a half cup of marinara sauce. We enjoyed the heck out of it! I made this yesterday and it was pretty good. I think I should have added a little more olive oil because it was a little dry. I also thin it could have used more red pepper because I didn’t really taste it. But I have to say that I don’t know how on earth you could chop up 2 heads of cauliflower and fit both into a skillet for sauteeing. I used one (which was large but not unusually so) and my 14″ skillet was packed. Any more and I would have had to do the sauteeing in batches. Good combination of pasta,walnuts and cauliflower seriously. Just finished eating and had to pull myself away from the pan. Yum. I’ve never had ricotta salata before and it was terrific. I agree about the amount of cauliflower — it took a while to soften, and I added more olive oil as it cooked. I also added more vinegar and lemon juice than is called for and loved the result. What a great melding of flavors in my mouth. Delicious! Made it tonight for my boyfriend and his parents, who happen to love cauliflower… and everyone went back in for seconds, and then continued to pick at the bowl! Only used 1 (large) head of cauliflower and added a little extra red pepper, and thought the balance was prefect! My husband and I made this last week, and even our 1-year-old could not get enough of the pasta (we carefully avoided giving her any red pepper flakes). So delicious! It really brings out the subtle flavor of cauliflower. Also, I really appreciated your tip (via Bobby Flay) about how to cut up the cauliflower. I was so impressed with how well that worked–it was like magic to me! i just made the cauliflower part (no walnuts/pasta) and added a few springs of fresh rosemary and a tbsp of butter. holy smokes. it was amazing. what is it with cauliflower? I just stumbled onto your blog, and I’m loving it =) I happened to make pasta this evening with steamed cauliflower and marinara sauce, and I must admit that even though it looked slightly strange, it was amazingly delicious. And I did half the normal serving size of pasta. Mmm. I can’t wait to try this recipe – it includes all of my favorite foods (cauliflower, walnuts, feta, oh my!). Thanks! Thanks for this one – I made about 1/3 of the recipe – and still have plenty for lunch tomorrow. I’m a hospital chaplain – on call tonight until midnight – so couldn’t actually enjoy the glass of white wine with it – but I enjoyed the idea! So glad I found this site – I’m finally looking forward to cooking again. This was seriously sooo yummy! I served this with grilled marinated chicken breasts. I’m trying to feed my boyfriend and I more veggies so this was a perfect fit. We both thought this was delicious! this was a great dinner and lunch the next day :) It was really tasty and flavorful. hooray! I came here by way of a Yelp DC thread about cooking. The first time I made this, I used fresh cauliflower but had undercooked the pasta. Tonight I just finished making the dish. I used frozen cauliflower but it still came out great! It tastes soo much better than my first attempt. Thanks for the great recipe! I just made this for dinner tonight — it’s really good! I didn’t have any feta, so I used chevre. My husband says to increase the walnuts, although I thought there were plenty. I’ll make this again. This made for a delicious and easy dinner tonight! I roasted the cauliflower with slices of onion, then tossed it with the pasta, a bit of pasta water, lemon zest & juice, and olive oil. I added the feta and toasted walnuts just before serving. I wish we hadn’t eaten so much of it – I would have loved it for lunch tomorrow. So yummy. This has been on the to-make list for a while, and I finally did. Now it’s on the must-make-regularly list. made this a few weeks ago. yummy. threw in some basil, substituted mizithra, added lemon zest. i love this site – the photos, the reads, the stories. amazing!!!!!!!!!!!!! This is delicious! Used whole wheat thin spaghetti, but probably a shorter pasta, like penne, is the way to go. I used a little veggie broth while cooking to cut down on the oil. Can’t wait for lunch tomorrow when I get to experience it all over again. Just have to find a way to hide it from my boyfriend. Is that wrong? YUM. Here is the thing: my biggest saute pan is not large enough to brown cauliflower so it wound up on jellyroll pans and being roasted (with the olive oil, onions, garlic, salt, pepper, hot pepper). What a perfect combination with feta & walnuts. I need a bigger pan. This is a big fave in my house, we have it at least once a month. Sometimes without pasta for a side dish. Last night I made it with rigatoni, goat cheese and added nutmeg for a little change. Fab. I made this lastnight, but with a bunch of modifications, due only to a lack of ingredients. First off, I used one head of cauliflower and one of broccoli, then I used lime juice instead of lemon, roasted cashews instead of walnuts, and old cheddar instead of feta. It still turned out beautifully and I have so many leftovers that I’ll be eating it for at least another day. Awesome side dish. I served it with my own recipe of root beer/orange ginger/ketchup/brown sugar-glazed chicken (I kind of invented the recipe when I didn’t have many ingredients on hand and just threw together what I had; it was delicious) and garlic-lime asparagus. It all made for a wonderful meal. Just made this today with a couple of modifications…I used purple, orange and white cauliflower and some broccoli (I found some already chopped up and ready to steam at Trader Joe’s), I didn’t have white wine vinegar, so I used white balsamic vinegar, and I used Mediterranean seasoned feta cheese crumbles. Very delicious! I love Smitten Kitchen! Your photography and commentary are excellent…I learn so much! On slow night shifts at work (I’m a nurse), I make a habit of cruising through your site via the ‘Surprise Me’ button…and I just found this recipe and something appealed! I’m not a ‘recipe-follower,’ but rather, I get immense satisfaction out of reading recipes and getting ideas for different, new combinations of ingredients and gleaning insight into interesting ways to cook them. Deb, good job on this one! I’d never stir-fried cauli quite this way before–tastes amazing! I used regular white penne, and fresh thai bird chiles instead of flakes, but other than that, *almost* actually followed the recipe:-) A definite hit! Really good alongside the roasted chicken I made tonight…. Looking for validation that cauliflower and pasta sauce go together, I found your recipe. For mine, I am making a oven simmered vodka sauce (Ina’s) so I popped my cauliflower in to roast along side. I am going to try it without adding any pasta…we had a broccoli pasta dish earlier in the week. I loved the idea of all the ingredients together. Somehow when I made it, it had too much tang—btw the feta, lemon and vinegar. I would propose leaving the wine vinegar out, and substituting a 2 Tblsp of the pasta water. Otherwise, it was terrific. Nice! 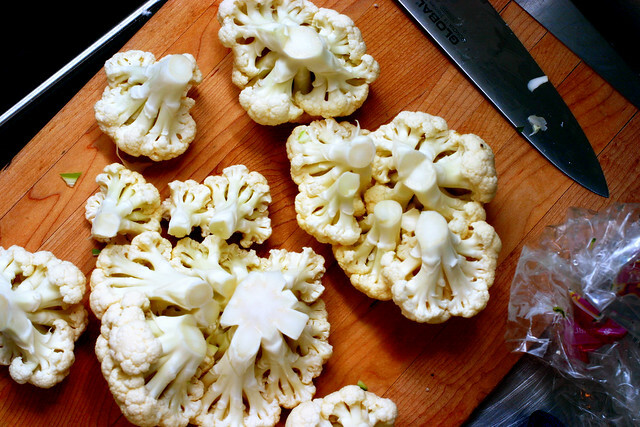 I needed some inspiration for what to do with the lonely head of cauliflower that came in our CSA, so I Googled “smitten kitchen cauliflower” and stumbled onto this. Problem solved — thanks! I made this over the weekend, and it was very tasty! Thanks! That’s the best way to prepare cauliflower I’ve tasted so far. It’s a keeper. This was incredible! Everything worked so well together, and being a huge fan of all things garlic and feta, I absolutely enjoyed it. I made it with a side of fresh wilted spinach. Yummy! You are right, it is so important not to overcook the cauliflower. It simply wouldn’t be the same. My husband is a big fan of Alice Waters, so we really enjoyed making this together. I absolutely love this site, but this recipe really fell flat for me. A few commenters already noted this, but it was nearly impossible to saute two heads of cauliflower in one pan. Also, combining the two heads with a pound of pasta made an absurd amount of food. Apart from that, I found this to be an incredibly bland dish and had to increase the vinegar, the feta, and the red pepper — and it was still boring (and beige). this is soooo good it doesn’t even make sense! i only used 1 cauliflower and less pasta, but the same amount of everything else. made it twice already…. second time, i added a handfull of raisins at the same time as the garlic. riddiculously good! i really do love smitten kitchen. it is my go-to-every-night-blarg-we-have-to-figure-out-what-to-eat-for-dinner-AGAIN site. thank you. After years, more than a decade really, of being off cooking (and I used to own a wee cafe! ), I have begun to want to make something that doesn’t involve the microwave. Stumbled on your site (from Apartment Therapy, perhaps?) and saw this recipe. The point I’m getting at is I’d just last week made a cauliflower baked dish, which was merely edible but made me think, “hey! I could substitute cauliflower for pasta!” Now I’m off to do so with some direction. Thanks so much, Ms. SK! I can understand why some commenters are saying this was bland, but I took steps to spice it up. I added a lot more than a pinch of red pepper, and I cracked black pepper over my personal plate to taste – the black pepper made a HUGE difference in bringing out the various flavors in this dish. And yes, the flavors are incredible and even better the next day for lunch! We have a variety of pans and a very large sauteeing pan, so we actually had no problem fitting 2 heads of cauliflower in it. As cauliflower doubters we were blown away by its transformation from bland and yucky to crunchy and flavorful. Fun, cheap, easy and delicious. Thanks for the amazing recipes. Yeah, you posted this how many years ago? But I just found it while browsing for something pasta-y to make for a vegetarian couple we had over last night. PHENOMENAL. My difficult-to-please husband raved and raved. Thanks again for another wonderful, reliable recipe. It is so flavorful with tons of garlic and onion, fits in a regular dutch oven style pan and made 5 normal sized portions. The extra red pepper flakes give it just the right amount of heat, I drizzled more olive oil before serving along with the fresh parsley, which really brightens up this dish visually and flavorwise, and the goats milk feta is just perfect- it’s more mellow and creamy then standard feta! Enjoy, this one is delish. I agree with the comment that the recipe would look a little beige. So I used yellow/orange cauliflower and next time I might use a combination of colours. For people who think cauliflower is naturally white (and I’m surprised how many still think this), it has always grown in a variety of colours. The yellow/orange (often called “cheddar”) is slightly less bitter or a little sweeter. One grower I know says that she sells way more coloured cauliflower than white now. Anyways, it looked very pretty. I too used more than a pinch of red pepper flakes. My garlic was very fresh (because it is summer) so I didn’t increase that but I think if people think this dish is bland, it could be because their garlic isn’t fresh (so they need to increase the amount for flavour) and their pepper isn’t fresh ground (again, not getting the flavour from it). Also, garlic cloves and heads of cauliflower really do vary so much in size that the recipe might need an indication of how many cups of cauliflower/how many tsp of chopped garlic. I used one large head of cauliflower but it is probably double the size of the ones I buy in the grocery store in the winter. Ditto for the garlic. I make this allllll the time. Toasted walnuts are the bomb and the feta makes it tastily salty. I am also bringing the walnut and sun-dried tomato pesto to a potluck tomorrow – I’ve discovered that you can make a tasty vegan version by leaving out the parmesan and upping the vinegar a bit so it still has zest to counteract the toasty nuts. I know this post is from way back when, but I felt compelled to comment. Being a huge fan of the site, I’m always looking at the archives for a recipe and I have stumbled across this one more than once. I always looked at it with the attitude you described in the introduction … this couldn’t possibly be good. But oh I was wrong. I finally made it tonight, and I’m about to go back for seconds. The walnut and whole wheat pasta really give the dish a great nuttiness, which plays off the lemon and vinegar. I added more feta (because I can never get enough) but everything else was spot on. Thanks for all the great recipes! Declicious. Eating right now. My only issues was that I didn’t brown the cauliflower enough. Still, incredible dish! For all the cauliflower haters….give it a try! Really enjoyed this dish but made the following modifications based on comments. I halved the cauliflower (only 1 head), the onion (1/2 onion) and the garlic (2 cloves) and used just 354g of pasta (which is about 0.7 lbs) because that was the size of one box purchased up here in Canada. Kept everything else as written and thought this was a great and hearty vegetarian main. Made this tonight and it was a total WIN. Toasted my own walnuts (because well, what else?) and the kitchen smelled heavenly (“Are you making popcorn?” sez Spouse). Almost caved in and went for a more traditional parmigiano or manchego but decide to stick with the feta, and am soooo glad. Both Spouse and I went back for (large) seconds. The cauliflower did take quite a bit longer to cook than I expected, but I just kept splashing in a little olive oil, a little white wine, etc. and it eventually browned up nicely. The end result was primo. I think next time I might throw in a handful of chopped parsley, just for a little color and bite, but really I don’t see how it could be improved. Another keeper! 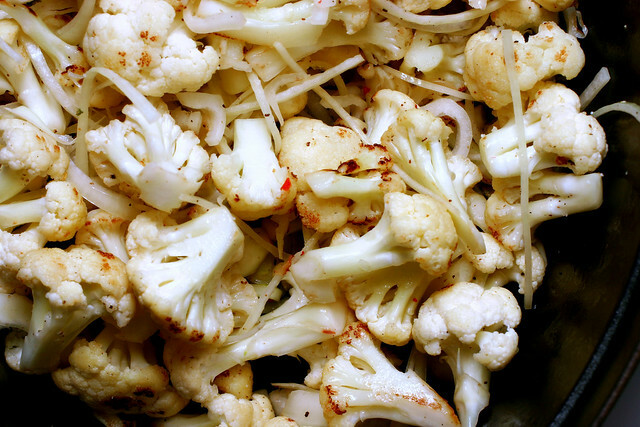 I made this tonight with roasted cauliflower – so good! Thanks Deb, I love all your recipes!!! Can’t wait to get your cookbook!! I thought it was going to be too bland, but the feta added all the saltiness the dish needs. Thanks! Yup. This was amazing. The cauliflower played well with the pasta, just like everyone said. I used pinenuts because I burnt what was left of my walnuts while trying to multitask. Looking forward to a few lunches from this! This is a new favorite in our house! SO delicious! Tasty! I’m not a big pasta person, but after trying this…maybe it’s because I haven’t been making the right recipes. Loved it! Love, love, love cauliflower… I eat it almost every day, and this recipe sounds so simple yet so delicious… I was thinking about making it gluten free though, maybe with some toasted brown rice penne? And to make it vegan, perhaps some capers for a salty bite? IDK, but will definitely test out!! I want to cry, this is so good. Also, my toddler loves it. WIN. Delicious! Substituted pistachios for the walnuts and added chard for more color and additional veggie goodness plus raisins for a sweet counterpoint to the salty feta. Yum. Made all of us, including the 7 year old, happy. I followed the suggestions of some of the earlier posters. I halved the amount of pasta and cauliflower, and kept the other amounts as written. It was perfect! Did everything as written, when I served it up, it had a bluish /purplish color about it, didn’t affect the taste, but I couldn’t eat it that color. Any idea how that happened, the pasta maybe??? love, love love your site and book. That often happens due to a reaction between iodized salt and garlic. Does that sound like what might have happened? Thank you Deb, its never happened before, but I am experiencing first times for a lot of things since I started following you….this is the only time I’ve had what I thought was a disaster though. Any tips to prevent this from reoccurring? Hi therese — Use kosher salt (I think they’re all non-iodized) or sea salt when using a lot of garlic. I tried this last night and it was very good (even if it looked kind of 90s!). I made a few modifications that I think help: I used 1 large thinly sliced red chili pepper instead of pepper flakes, red onion instead of white, I added some lemon zest in addition to the juice, and I also mixed in a some reserved cooking liquid from the pasta (about 1/3 to 1/2 cup) at the end to loosen it all up a bit. I didn’t have parsley, but that would have been a nice touch, as it is in your pictures. I made this as a side dish – leaving out the pasta and it was delicious!! I’m making it again this week. I liked this recipe, but didn’t love it. Maybe next time I’ll cut the cauliflower smaller and/or add pancetta or bacon. I just made this and it was fantastic! I subbed goat cheese for feta (it’s what I had on hand), but followed the rest of the recipe to a T. It was easy to throw together and I plan on making it again. I made this 2 nights ago. Amazing. Even reheated very nicely (2 30-second intervals, with a shake of the Tupperware in between) the next day. I had never made anything with cauliflower before! Great recipe – thank you!! Since you are a convert to pasta and cauliflower, you should try this. My family is nuts for it. I use arugula instead of parsley and I use way more of it. It’s delish. I did it and it tastet quite well, but yo need to be careful when first sauting the cauliflower, it gets brown very quickly when it’s too hot, but it stays very crunchy anyway. Don’t be stingy with oil. This is super delightful with the slivered skin of preserved lemon added! I made this yesterday and loved the flavors. I didn’t have any cheese so I just added a tablespoon of sour cream (for the recipe halved). I used balsamic vinegar. It was delicious, but the dish was not very appealing visually as all of the ingredients end up being brown. Next time I will try to sub the cauliflower with brocoli or purple cauliflower, or add some asparagus as a previous commenter suggested. I’m eating the leftovers now for this delicious dish. We make it with brown rice pasta to accommodate a gluten sensitivity, though I imagine the bite of the whole wheat would be even better. Ours turns purple too, though, even though we use non-iodized kosher salt. My suspicion is that the grocery store feta (all that’s available here, sadly) probably has been produced with iodized salt. Aside from the mousy hue, this dish is a winner. Be sure to chop the walnuts – you’ll want some in each bite. Thanks Dab! Made this over quinoa tonight – so delicious! This is definitely going into regular rotation. Fail… i just made this. It was ok but a bit boring. What did I do wrong? German greek feta? I don’t know. The one cauliflower pasta dish somebody mentioned above with saffron, raisins and sundried tomatoes and maybe black olives is great. O.M.G. Wow this recipe is so good. I have made this numerous times, it is really my favorite way to use cauliflower. When I’m feeling like I want a decadent meal, I use a generous supply oil to saute the cauliflower. This dish is a big win with the family. This was delicious! I love cauliflower and feta and walnuts and pasta so I did not hesitate. I made it with Trader Joe’s gluten free pasta (because i had to… sigh) and it was great. I cannot believe I’ve been making this for 10 years and our family shows no signs of tiring of it. Thanks, Deb! I made this tonight; it’s good enough that I’m willing to eat left overs for lunch tomorrow and they might even make it long enough to be another dinner. However, I think I’m not a practiced enough cook to have made this dish well. My guess is that if I had it at your house or at Alice Waters’s house, I’d love it more b/c you two would be much better at getting the cauliflower right and the seasoning right. I, on the other hand, found there to be some flavor lacking in the dish… which I tried to fix by adding more pepper and lemon juice, but then the whole thing was overly sour. Either way, I’m not tossing the recipe – it just takes some skill and I need more practice. Loved it! Some tweaks.. it was a little dry so did some half and half at the end. (Also then my husband couldn’t tell it was whole wheat pasta!). Also reading some seasoning comments, I added capers for some additional acidity without the sour of more lemon or vinegar. Really good! Will cut up the cauliflower smaller next time to blacken more. But there will be a next time! Has anyone roasted the cauliflower in the oven? This is usually how I get it toasty yet somewhat crisp. Just wondering. I’m hesitant to try it in the pan. I felt the same way when I made it tonight, but went ahead and sautéed it, and it was fine. Do turn the heat up on the pan though, so it has a chance to brown, and watch it carefully, especially after you add the onion. It’s nice to have one less pan to wash, too. However, I think you would still get great results if you roasted the cauliflower, too. I made this tonight, and it was wonderful! I did tweak a few things ( mostly proportions) – I used 1 head cauliflower and 8 oz pasta (whole grain rotini), but kept the other amounts the same. The dish doesn’t need much lemon juice or vinegar as the feta is pretty acidic already ( I think you could omit the vinegar altogether). I used Aleppo pepper instead of red pepper flakes, I added the grated peel of 1/2 lemon, and I reserved 1/2 cup pasta cooking water to add at the end. Be sure to salt everything adequately – it would be pretty bland without it, IMO. I’m looking forward to leftovers tomorrow. This was absolutely delicious! I did everything exactly as written except I used regular ricotta (our local megamart did not have ricotta salata and I dislike feta). We simply placed a spoonful of the ricotta on top of the individual dishes and it was superb! I would definitely make it again.